Is life too short to eat healthy? I had an interesting conversation recently about whether we should bother eating healthily. After all, life is too short to be worrying about what you eat, isn’t it? We only get one life (Hindus may disagree) so we may as well enjoy it. While I agree everyone should enjoy his or her life, eating unhealthily could actually make your existence even more miserable. Why? It’s a fair point that some people raise when they say ‘I’ve been eating junk food all my life and I’m not overweight and there’s nothing wrong with me.’ That’s true (even though some of the people saying that may be fat and deluded about their weight), but you’ll find that it is young people who say this, mostly. 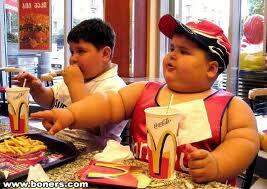 What they have yet to discover is the effects eating a life of junk food can have later on in life. Fine, you may not seem unhealthy on the outside, but God knows what your inside looks like. Furthermore, when people get cancers, heart disease and all the other prevalent diseases in our societies, a substantial amount of research in recent years indicates that it is because of a life-long bad diet. So, just because you seem fine at the moment, it doesn’t mean the food you eat wont catch up with you later on in life. Eating healthy also helps the mind to function better, this is an accepted fact. If the mind is also healthy, one is more likely to get more out of life, be more productive, and, ultimately, be happier-surely? ‘But healthy food doesn’t taste as nice’, some of you may be whining. Hmm, that’s nothing but your state of mind and what you have been brought up eating. If you’re brought up eating healthily, you’re bound to prefer healthy food over unhealthy food-not that junk food isn’t nice, most of it is… But of course, eating the odd chocolate, biscuit and drinking coke every now and then wont harm you-it’s all about moderation as the saying goes. But it is when junk food is incorporated into our daily diet it can become a problem. The main reason, in my opinion, why junk food is so ubiquitous in our sugar-saturated society, is because not only is it generally nice but because it is cheap. When food is cheap and cheerful it becomes something we buy because it suits our lifestyle. And then when we can’t see any immediate damaging effect of the food on our body, we continue in our heedless ways. Eating healthy has physical benefits, psychological benefits, and for the religious people out there: it can even lead to a better spiritual life. Psychologists tell us that a person who can control their appetite, can control every other desire. It therefore becomes a form of helping one to attain self-restraint and helps to discipline the soul. Why are the youth so crime-obsessed? Why would I go to the cinema to watch a wildlife documentary? Cheers pal. I do apreipcate the writing. The thing is, healthy food DOES taste nice if its organic. The fruit and vegetables I eat in Turkey taste sooo different to the ones I buy in supermarkets, I feel like am eating something that is disguised as fruit :S yeh so reli the quality of the “healthy food” we buy isnt good enough/doesnt taste nice so naturally people buy things that taste nice.